How does the SMp(x) distribution work? If you came across this SMp(x) distribution calculator, you probably already know more about statistics and probability than an average person. Now, it's time to go one step higher: this tool will allow you to simulate virtually every probability distribution, such as the standard normal distribution or the Poisson distribution. All you need to do is choose the correct six parameters describing the SMp(x) function. Sounds interesting? Let's dive right in! Imagine that you're trying to predict the temperature in your city for the next day. It's summer, and you know that the lowest temperature ever recorded in your town in summer was 62°F, and the highest was 107°F. You assume that the temperature tomorrow will fall somewhere in this range, but you don't know for sure where. All you can do is assign a probability to each value - for example, there might be 5% chance of temperature in the range 62-72°F, 10% chance for temperature in the range 72-82°F, and so on. The value of a probability function is never lower than zero. If you integrate the function over its whole domain (from the minimum to maximum), the value of the integral (called the probability density function) will be equal to 1. It means that one of the outcomes must happen - there's zero chance that none of them will take place. PXmin is the lower limit value of the variable x. In the case of temperature described in the previous section, PXmin was equal to 62°F. Xmax is the upper limit value of x - in our example equal to 107°F. ML is the value of variable x where the probability distribution function achieves its maximum value. In other words, it is the most probable outcome. In many distributions, it is assumed that ML is the mean of PXmin and Xmax, but it's not always the case. p₁ and p₂ are the powers of the model. They both have to be greater than zero. The shape of the distribution function hugely depends on these two parameters - for example, p₁ = p₂ in a normal distribution. Max is the maximum of the SMp(x) function. For example, if it is most probable that the temperature will be equal to 85°F, and this probability is equal to 30%, then Max will be equal to 30%. 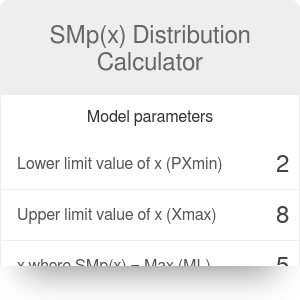 The easiest way to use the SMp(x) distribution calculator is to simulate the normal distribution. To achieve this, you need to remember that for such a function, the six parameters are not entirely independent of one another. The powers of the model have to satisfy the condition p₁ = p₂ > 1. The minimum must fulfill the condition PXmin ≥ 0. The function must be symmetric, i.e. the condition ML = (PXmin + Xmax)/2 has to be fulfilled. The area under the curve is equal to 1. This condition is satisfied only if Max = (p₁ + 1) / [2(ML - PXmin)]. If all these conditions are satisfied, you can use the SMp(x) distribution as a normal distribution with a mean value of μ = ML. what is the probability of variable x being exactly between two constants x₁ and x₂ (for example, what is the probability of the temperature being in the 80-90°F range). For PXmin < 0, the powers of the model have to satisfy the condition p₁ > 1 or p₁ = 0. Additionally, p₂ > 1. For PXmin ≥ 0, the powers of the model have to satisfy the condition p₁ > 1 and p₂ > 1. There are many more applications of this function, such as simulating the binomial distribution or the exponential distribution. If you're interested in the topic, we strongly recommend reading a paper elaborating on it, called "The SMp(x;PXmin,Xmax,ML,p1,p2,Max) a probabilistic distribution of a random discrete variable, or a probability density function" and developed by Terman Frometa-Castillo, the founder of Statistical models project (SMp). SMp(x) Distribution Calculator can be embedded on your website to enrich the content you wrote and make it easier for your visitors to understand your message.